consider as a general proposition that the new situation requires new decisions. The Military Representatives are of opinion that it is highly desirable that the American Government should assist the Allied Armies as soon as possible by permitting in principle the temporary service of American units in Allied Army corps and divisions. Such reinforcements must, however, be obtained from other units than those American divisions which are now operating with the French, and the units so temporarily employed must eventually be returned to the American Army. The Military Representatives are of the opinion that from the present time, in execution of the foregoing, and until otherwise directed by the Supreme War Council, only American infantry and machine-gun units, organized as that Government may decide, be brought to France, and that all agreements or conventions hitherto made in conflict with this decision be modified accordingly. The purpose of the American Government is to render the fullest cooperation and aid, and therefore the recommendation of the Military Representatives with regard to the preferential transportation of American infantry and machine-gun units in the present emergency is approved. Such units, when transported, will be under the direction of the Commander-in-Chief of the American Expeditionary Forces, and will be assigned for training and use by him in his discretion. He will use these and all other military forces of the United States under his command in such manner as to render the greatest military assistance, keeping in mind always the determination of this Government to have its various military forces collected, as speedily as their training and the military situation permits, into an independent American Army, acting in concert with the armies of Great Britain and France, and all arrangements made by him for their temporary training and service will be made with that end in view. While note No. 18 was general in its terms, the priority of shipments of infantry more especially pertained to those divisions that were to be trained in the British area, as that Government was to provide the additional shipping according to the six-division plan agreed upon even before the beginning of the March 21 offensive. On April 2 the War Department cabled that preferential transportation would be given to American infantry and machine-gun units during the existing emergency. Preliminary arrangements were made for training and early employment with the French of such infantry units as might be sent over by our own transportation. As for the British agreement, the six-division plan was to be modified to give priority to the infantry of those divisions. 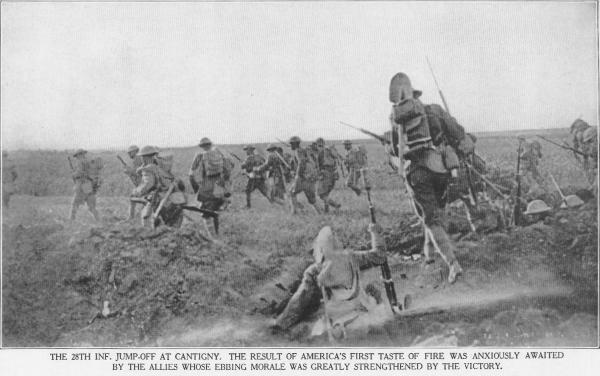 However, all the Allies were now urging the indefinite continuation of priority for the shipment of infantry and its complete incorporation in their units, which fact was cabled to the War Department on April 3, with the specific recommendation that the total immediate priority of infantry be limited to four divisions, plus 45,500 replacements, and that the necessity for future priority be determined later.